These cookies are seriously so quick and easy to make, but taste like you spent a lot of time on them. They are so fudgy and chewy- I have yet to meet a person who doesn’t like them. The best part about these cookies is that they only require 4 ingredients (and I bet that you have them in your pantry right now!). Preheat oven to 350 degrees. Stir together the dry cake mix (do not follow directions on the box- you just want to use the dry ingredients that are in the box), oil and eggs in a large bowl until dough forms. Dust hands with confectioners' sugar and shape dough into 1- 1.5" balls. Roll balls in confectioners' sugar and place 2 inches apart on ungreased cookie sheets. Bake for 7-9 minutes or until center is JUST SET. Remove from pans after a minute or so and cool on wire racks. Preheat oven to 350 degrees. Stir together the dry cake mix (do not follow directions on the box- you just want to use the dry ingredients that are in the box), oil and eggs in a large bowl until dough forms. Dust hands with confectioners’ sugar and shape dough into 1- 1.5″ balls. Roll balls in confectioners’ sugar and place 2 inches apart on ungreased cookie sheets. Bake for 7-9 minutes or until center is JUST SET. Remove from pans after a minute or so and cool on wire racks. I have made these with a lemon mix and toppedit with a glaze of butter powdered sugar and lemon juice. They were great! I just made a recipe using yellow cake mix, the oil and 2 eggs, and then choc. chips and coconut. They were so delicious and chewy. I know these will be good too! I have made cookies just like these, and after they come out of the oven, I press a peppermint pattie into the top of each cookie. Yum! Thanks for sharing all your yummy recipes! Oh--I forgot all about these for Christmas. They are so easy and yes--delicious. 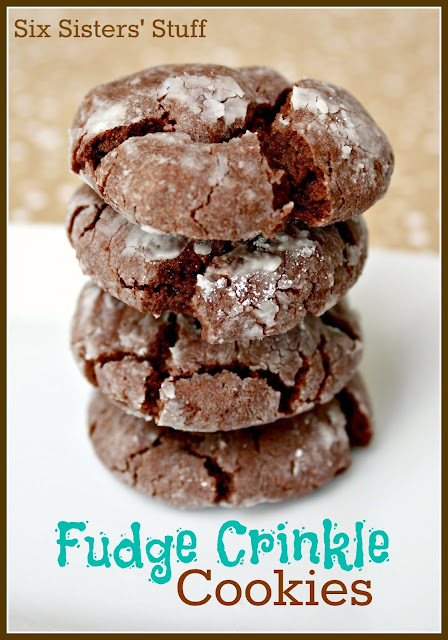 Alot less work than the chocolate crinkle recipe that has been around for years. Just as good--if not better--dare I say ! I made a red velvet version w/ Duncan-Hines boxed red velvet mix that were to die for so I'm sure these will be equally amazing! I just showed these to my 3 year old and she said they looked like "the best cookies in the world." You have a new, very young (but honest) fan! Thank you for sharing them on my Link Love Thursday link party! Loved these :) They didn't last long at all. These look wonderful! I love the crinkle. Pinned to try soon, thanks! I made these and substituted Coconut oil for the veg oil. I could.NOT.STOP.EATING.THEM! So amazingly delicious and easy!! Im gonna make these for my kids...can I use 1/2 cup of applesauce instead??? why did mine not turn into "balls" the dough was super sticky like thick cake batter or a slightly too thin frosting. i plopped spoonfulls in the powdered sugar and "rolled" it into balls, but they instantly spread on the cookie sheet. we'll see how they turn out... thoughts? We have never had a problem with these cookies. They turn out so well. Does your cake mix ounces match ours?